When entering the cold winter season, we need to prevent the water in the air source heat pump system from freezing and expanding, which results in damage. 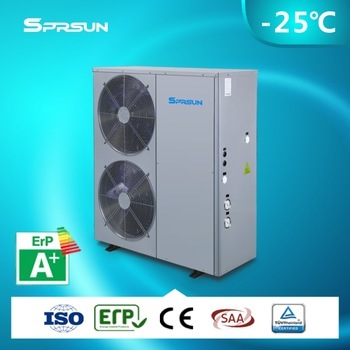 In order to enable you to better use the heat pump system and avoid the failure of heat pump units, it is necessary to operate the heat pump units according to the air source heat pump user's manual or instructions. At the same time, prepare well for anti-freezing in winter to ensure the safety and normal use of your heat pump system, avoiding the freezing damage and unnecessary loss of the air heating system caused by power failure, water shortage or improper operation. When the ambient temperature reaches the freezing point, the water temperature of an source heat pump water heater drops quickly. If the hot water pipe and the return pipe do not take insulation measures, the heat consumption will be accelerated. Air source water heaters mainly use thermal insulation cotton or polyurethane foam for pipe insulation. Small pipes are generally insulated by thermal insulation cotton while large ones are often insulated by polyurethane foam. Ensure that heat pumps are powered on when they are in normal use. Maintaining the heat pump's power supply in winter cannot only ensure that the air source heat pump water heater can provide hot water all day long and but also make sure that the unit does not frost so that it can run normally. Both air source heat pump water heaters and heating units could start their automatic anti-freezing protection function when the outdoor temperature is low in winter. When heat pump units are not used in winter, water should be drained in time. If the air source heat pump unit does not run in winter or needs long shutdown, such as frequent power outage and shutdown at night, the water in the system should be emptied to prevent any freezing damage. And the power supply should be cut off with a protective cover to cover up the unit. When running again, please check the system thoroughly before starting. Antifreezes must be added to the air source heat pump unit if water is not drained. According to the specific use of customers, when the water in the unit is inconvenient to drain and empty in winter and the water or power may be cut off, the whole air source heat pump heating system must be added with antifreeze fluid. The selection of antifreeze fluid must be based on the local minimum temperature as an important parameter. If it is found that the air source water heater pipeline has been frozen but not cracked, do not knock on the pipeline or pour hot water on the pipeline. Just wait for its natural melting.